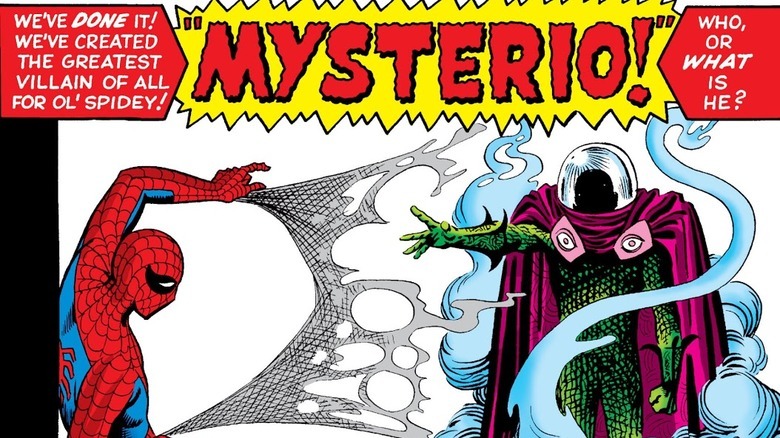 Out of all Spider-Man's arch-nemeses, none are quite as weird and mysterious as Mysterio, the master of illusions. WIth his dome helmet, purple cloak, and fishnet-covered green bodysuit, he's an instantly recognizable supervillain. But just because you can recognize him on sight doesn't mean you know everything there is to know about the arachnid-hating trickster who's been one of Marvel's most tenacious villains. Fittingly for a supervillain that uses tricks, illusions, ridiculous technology, and hallucinogenic gas, there are a lot of strange stories and little-known facts about Mysterio — not to mention all the times that Mysterio himself turned out to be an android, another person under the mask, or an illusion himself. From his role as one of Spider-Man's very first villains to helping to loosely inspire the plot of 2018's major motion picture Into the Spider-Verse, read on to learn about Spider-Man's strangest arch-enemy. Of everyone who's ever worn Mysterio's fishbowl helmet, Quentin Beck — created by Steve Ditko and Stan Lee — is by far the most well-known. Originally a stunt man and makeup artist who turned to crime after getting frustrated with the movie industry (an extremely relatable origin), Beck first appeared in Amazing Spider-Men #13. His first step in taking down Spider-Man was to impersonate the masked webhead by using his technological prowess to mimic Spidey's powers and frame him for various crimes. With Spider-Man's popularity at an all-time low, Mysterio could swoop in as a hero when he took down Spider-Man (along with keeping the money he'd stolen earlier). As you'd expect, Spider-Man took down Mysterio and cleared his name, but Mysterio would continue to pop up later, as one of the original members of the Sinister Six and as a singular thorn in Spidey's side. 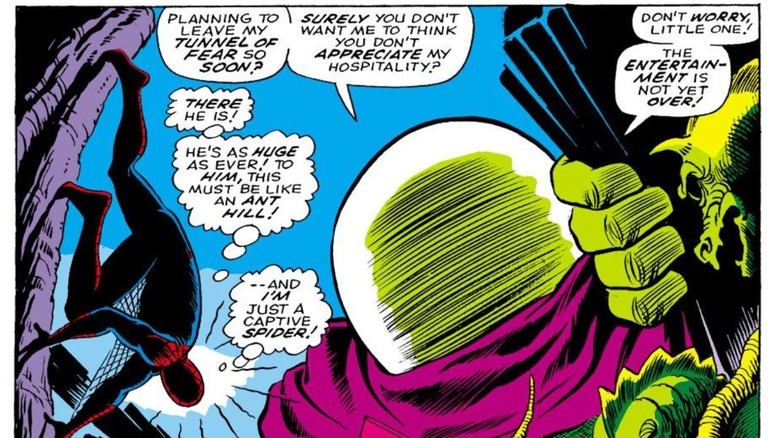 However, while Mysterio's first appearance was technically in Amazing Spider-Man #13, a retcon in 1980's Spectacular Spider-Man #50 established that he actually appeared earlier (in disguise) in Amazing Spider-Man #2 as one of a crew of aliens. This retcon helped to establish arguably Mysterio's greatest strength as a character: his ability to make any story — no matter how bizarre — part of the mainstream 616 comics universe with his illusions. This gave writers the ability to write stories that imagined Peter Parker as a movie star (more on that later) or shrunk down to the size of an actual spider without requiring any lasting implications. 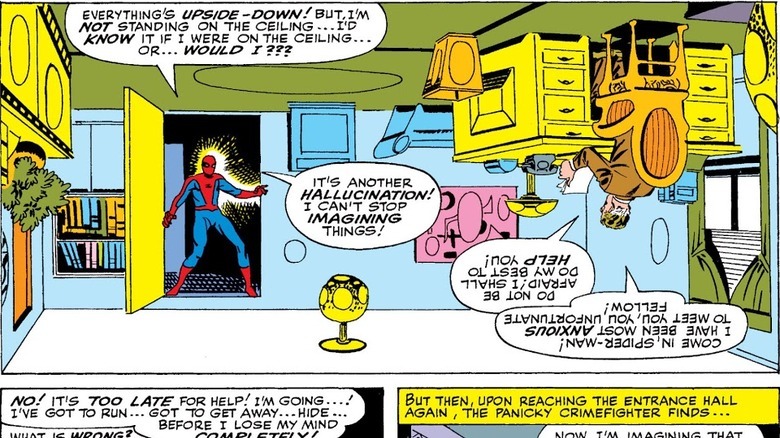 One of Mysterio's other great strengths as a Spider-Man villain is that his technological brilliance and showmanship allow for bizarrely intricate set pieces. Much like another Marvel villain, Arcade, Mysterio's penchant for over-the-top illusions and androids lends itself to some bizarre stories — like the time he "shrunk" Spider-Man down to six inches in Amazing Spider-Man #66-67. In the story, Mysterio breaks out of prison and lures Spider-Man to his new lair — complete with a small model of an amusement park. When Spider-Man arrives, he's hit by a strange laser and awakes… in the amusement park facing off against a giant Mysterio. After surviving trap after trap, Spidey eventually realizes that it's not that he's been shrunk down—it's that he's actually in a giant amusement park, and the giant Mysterio is (literally) smoke and mirrors. While it's a very Arcade-esque adventure, the biggest difference between the two is that Arcade's murderous funhouses are always in the service of his own entertainment, while Mysterio's just a tiny bit more committed to making superheroes question their own identity. 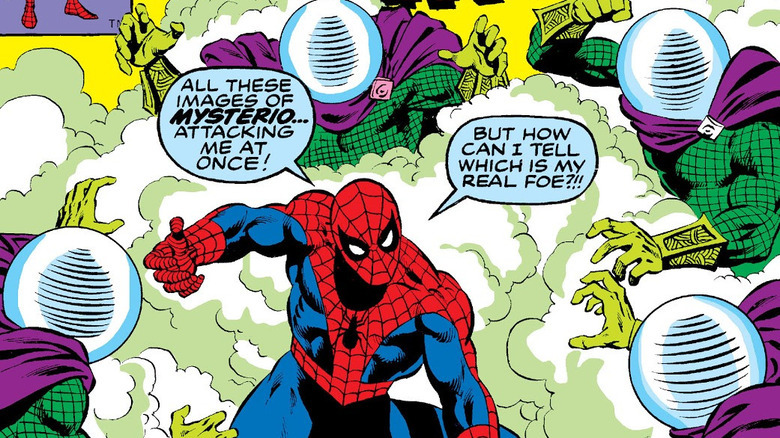 Mysterio's penchant for trying to drive Spider-Man insane shows up very early in the character's identity — as early as 1964's Amazing Spider-Man Annual #1, he's already using androids and hallucinogens to trick the web-head into fighting shadows. In 1965's Amazing Spider-Man #24, Mysterio's dedication to the long game is truly demonstrated when Dr. Ludwig Rinehart arrives at the Daily Bugle, making a compelling case that Spider-Man is a hair's breadth away from complete insanity. Spidey shrugs it off at first, but when he begins to see his arch-villains crawling out of the walls to attack him before disappearing in smoke, he's a bit more convinced. He pays Dr. Rinehart a visit to see if he can get some help, but the hallucinations get so bad that Spider-Man gets one step away from revealing his secret identity to Dr. Rinehart — until Bugle boss J. Jonah Jameson bursts in to accuse the not-so-good doctor of being a fraud. With his mind clear, Spidey quickly defeats Dr. Rinehart and discovers, as you might have expected, that it's actually Quentin Beck in disguise. While Beck's plan wasn't successful, it established his modus operandi early on — Mysterio could never beat Spider-Man in a fair fight, so he uses deception to drive the wall-crawler to defeat himself. As you might expect, Amazing Spider-Man #24 wouldn't be the last time that Mysterio would try to drive Spider-Man insane — another notable instance was in 1992's Web of Spider-Man #90. In the issue, Spider-Man wakes up after a bad run-in with Galactus to find that he's a card-carrying, A-list celebrity who's been enjoying the good life ever since his brief stint in the wrestling ring against Crusher Hogan — an event that happened way back in Amazing Fantasy #15, his very first appearance. Something's amiss on the set of his newest feature film (in which he avenges nearly every other A-list superhero in fighting against Galactus) when some of his toothiest villains attack. 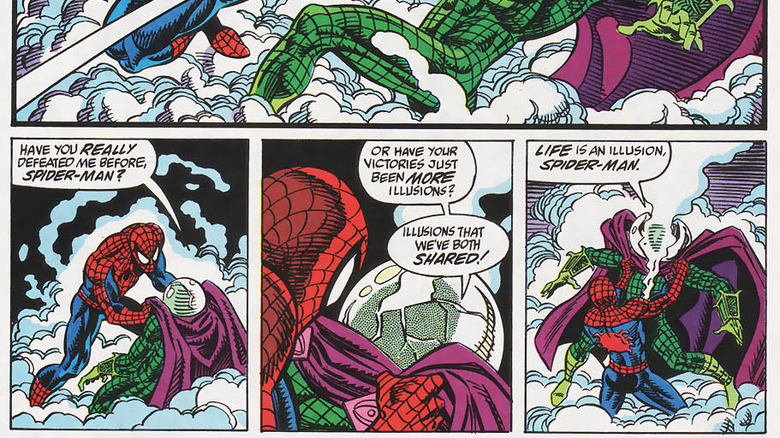 After dispatching Hobgoblin and Venom, Spidey figures out what's really going on — Mysterio hired Max Shiffman (the guy who first hired Spider-Man to wrestle against Crusher Hogan) to provide a measure of reality with which he could construct an entire alternate life for Spider-Man to get trapped in. While the ploy is classic Mysterio, the issue is notable for an additional wrinkle that it provides to Mysterio's character — while fighting Spider-Man, Mysterio reveals that when his helmet was cracked during their first fight, it exposed Quentin to the hallucinogenic mists that lets him control illusions. With his own exposure to the mists, his own grasp on reality was shattered, leaving him unable to tell illusion from reality. It's a take on the character that's only been occasionally revisited, and a compelling extrapolation of his motivating drive. Mysterio and his arch nemesis: Daredevil? The Marvel Universe was built, brick by brick, as a cohesive whole. Spider-Man's very first issue has him dropping by to hassle the Fantastic Four, and supervillains regularly fought heroes outside their purview even before the crossover Acts of Vengeance made a whole thing about it. Daredevil and Spider-Man have an especially long bad guy exchange program. Kingpin, arguably one of Daredevil's greatest and most well-known arch-enemies, was originally a Spider-Man villain. The Owl, Electro, and, of course, Mysterio have all jumped back and forth between the heroes. In "Guardian Devil," an arc of Daredevil written by Kevin Smith and drawn by Joe Quesada, Daredevil wrestles with the responsibility of taking care of a child that seems to be either the Messiah or the Anti-Christ. However, after a quick consultation with Dr. Strange and Mephisto (more or less the actual, literal Devil in the Marvel Universe), he realizes that he's just been drugged and that the baby is just a baby. Mysterio, newly diagnosed with lung cancer and an inoperable brain tumor from his years of getting high off of his own hallucinogenic supply, had enacted a grand revenge scheme against his second-most hated foe. Once the trick was revealed, Mysterio was hopeful that Daredevil would kill him. Once that failed, Mysterio took care of the matter himself, in a death that spelled the end for Quentin Beck's run as Mysterio (for a while). 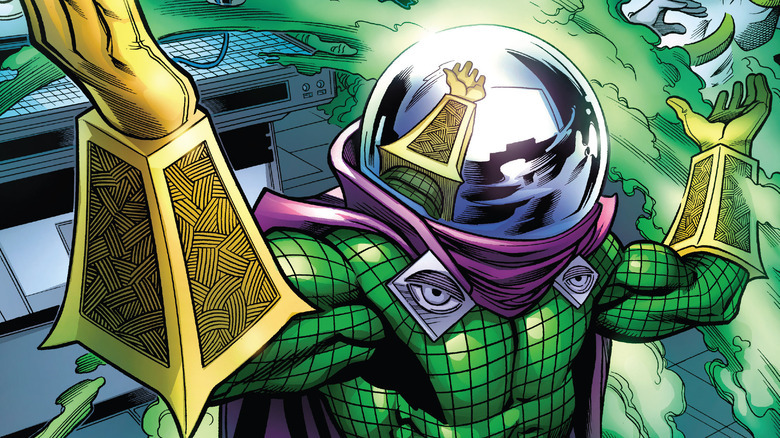 While there are other people who have worn the Mysterio mantle in the 616 (main) Marvel Universe, there's another Mysterio worth mentioning: the Mysterio of Earth-1610, a.k.a. the Ultimate Universe. These days best known for being the visual inspiration for a decent chunk of the Marvel Cinematic Universe (notably reimagining Nick Fury as a cool-as-ice Samuel Jackson lookalike), the Ultimate Universe was an attempt in the early 2000s to reboot Marvel's increasingly complicated lore for a new audience. Set in a new universe, the comics line would follow Spider-Man, the Fantastic Four, the X-Men, and the Ultimates (a twist on the Avengers) in a streamlined world that was similar to, but distinct from, the mainline 616 universe. 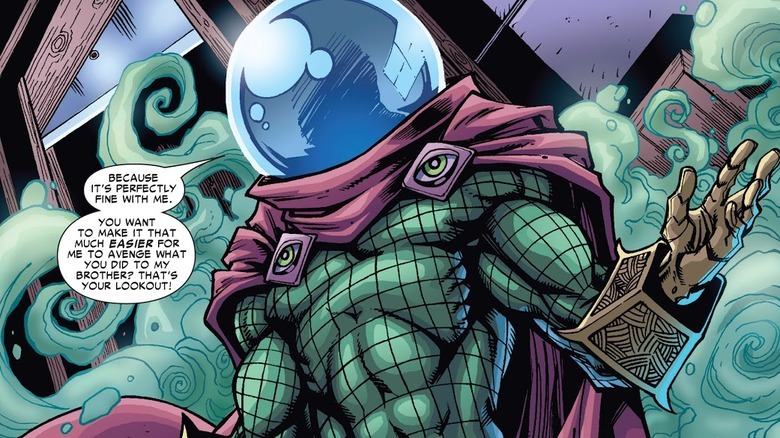 While other characters would get a complete top-to-bottom reimagining, the Ultimate version of Mysterio wasn't all that different from the 616 version. 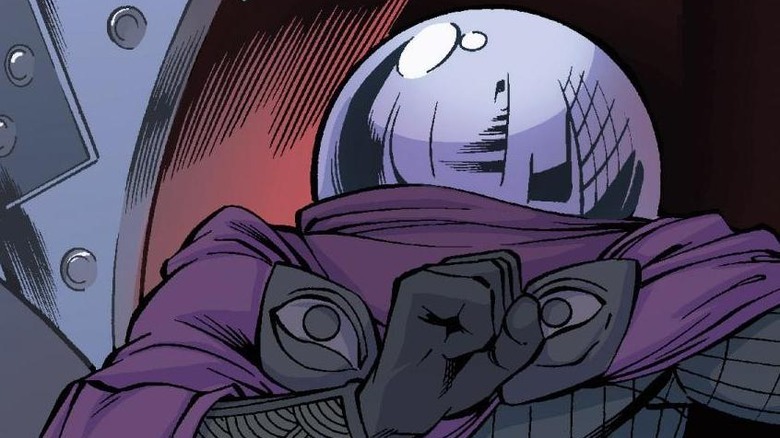 Created by David LaFuente and Brian Michael Bendis in Ultimate Spider-Man Annual #3, Ultimate Mysterio's biggest difference between his 616 counterpart was that he had a worse costume. While some would find fault with a fishnet-covered green bodysuit and fishbowl helmet, you can't argue that it isn't immediately recognizable. 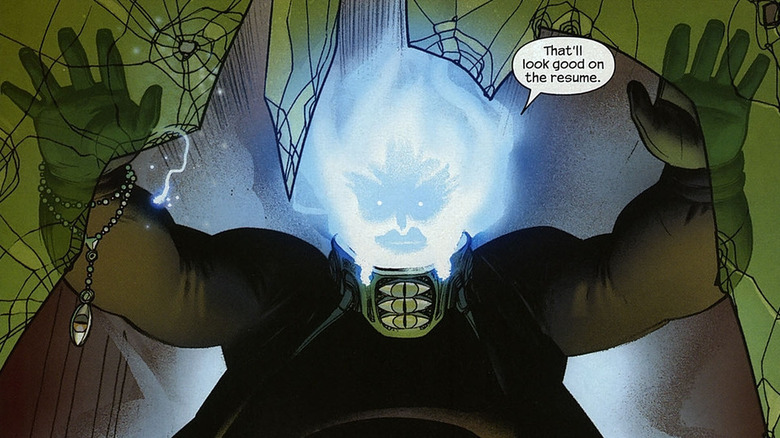 The Ultimate version of Mysterio had none of his predecessor's flair, using only a boring ghost-like effect over his face as a disguise. As it turns out, there was a reason that the Ultimate Mysterio wasn't all that different from the 616 version. The reason that the two characters weren't all that different is that they weren't actually two characters at all; instead, the Ultimate Mysterio was a ridiculously high-tech android piloted across universes by the 616 Mysterio in order to… accomplish the same kinds of crimes that he got up to in his home universe. This was revealed in the Spider-Men miniseries which saw Peter Parker cross into the Ultimate Universe while fighting Mysterio. While there, he ran into Miles Morales, the Spider-Man of the Ultimate Universe, and gave him a bit of much-needed guidance on what it takes to be a hero. If that's all sounding just a bit familiar, it's because the plot was loosely adapted for 2018's Into the Spider-Verse motion picture, along with a couple of other cross-dimensional Spider-Man stories. 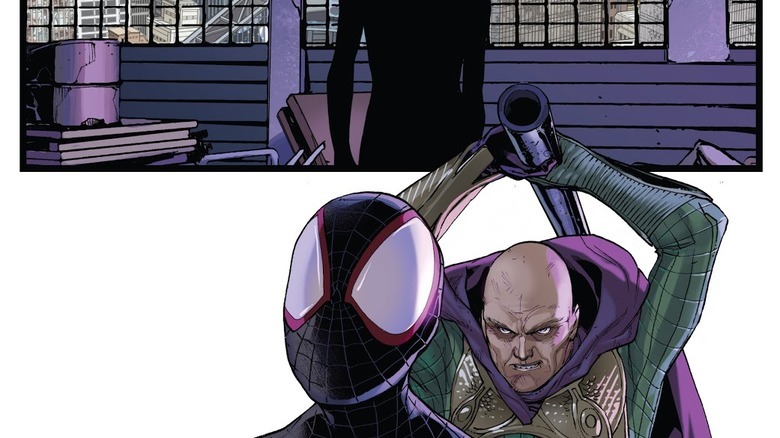 Spider-Men ended with Mysterio in custody in the Ultimate Universe, leaving the role of Mysterio to be filled by other, lesser criminal geniuses. As mentioned earlier, Quentin Beck isn't the only man to wear the delightfully goofy mantle of Mysterio. Created by Ross Andru and Gerry Conway in Amazing Spider-Man #141, Daniel Berkhart was a stuntman who took over for Mysterio in between the original's deaths and resurrections — in a comics universe, no one stays dead for long, especially the original villains. While it's hard for any villainous replacement to usurp the original, Berkhart never really had a unique spin on the Mysterio identity. His most well-known stories involved him pretending to be a resurrected Quentin Beck in order to torment Spider-Man. When your best-known accolades are pretending to be a more beloved character and generally succeeding, you're not really going to last long in a comic book universe. Even when he got title billing in his own miniseries, Spider-Man: The Mysterio Manifesto, he spent most of the story dressed as Jack O'Lantern, an entirely different supervillain identity. Created by Rachel and Terry Dodson and Kevin Smith in Spider-Man/Black Cat: The Evil That Men Do, Francis Klum is arguably the worst Mysterio. Unlike other Mysterios, Klum actually has super-powers: he's a mutant with the ability to teleport, along with some assorted telepathy and telekinesis. In a complicated series of events, Klum ended up accidentally getting knocked off a bridge by Spider-Man, which led to Klum losing part of his leg. As you might expect, this led him to embark on a crusade of vengeance against Spider-Man dressed as one of his old enemies, Mysterio, in Friendly Neighborhood Spider-Man #11. His crusade of vengeance didn't last long, though — he was interrupted by both Quentin Beck and Daniel Berkhart in their own Mysterio garbs. Even worse for Klum, he was eventually stabbed in the chest by thousands of spiders wearing the form of a school nurse (comics, baby!) and presumably died since he hasn't been seen since. While Berkhart and Klum popped up to cover for Beck while he was dead, who fought Spider-Man while Beck was stuck in the Ultimate Universe after the events of Spider-Men? That's a good question, and it turned out to be a brand new character: Mysterion. 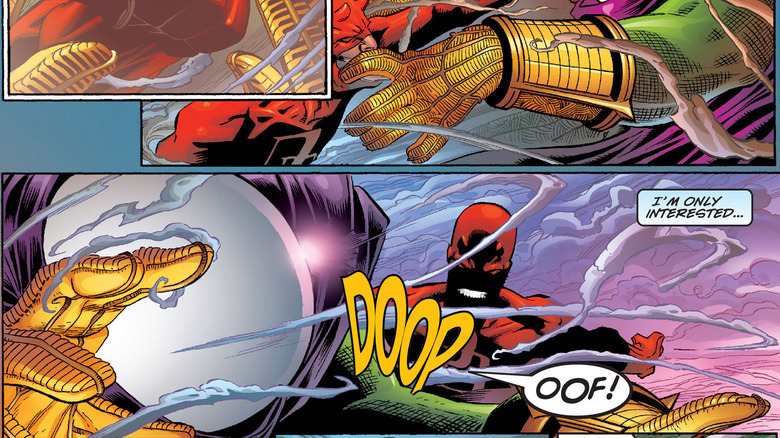 Created by David Lopez and Christopher Yost in Avenging Spider-Man #23, Mysterion was… basically the same as previous Mysterios, except not quite as competent. In the issue, he picks up the costume and gear from Hobgoblin before running afoul of both the Punisher (kills supervillains) and the Superior Spider-Man (a Spider-Man with the soul of Doctor Octopus who also kills supervillains). Somewhat surprisingly, he actually managed to survive the encounter and popped up a couple more times in the Marvel Universe — most notably fighting Squirrel Girl in Unbeatable Squirrel Girl #5. Unfortunately, without an actual name or defining features, we're unlikely to see much more of Mysterion going forward. While many have worn the fish bowl, only Quentin Beck seems to be truly worthy. Considering how closely his power set aligns with movie magic, you would have expected Mysterio to make an appearance in a cinematic Spider-Man adaptation long before 2019's Spider-Man: Far From Home. As it turns out, he quite nearly did. Jeffrey Henderson, a storyboard artist who worked with Sam Raimi on the original Spider-Man trilogy revealed that a planned Spider-Man 4 would have included Mysterio. Speaking to io9, he said the film would have included "a montage of C and D- list villains that we knew would never be used as main antagonists: Mysterio, the Shocker, the Prowler, the old school-onesie-wearing version of the Rhino, maybe even the Stilt Man, etc." 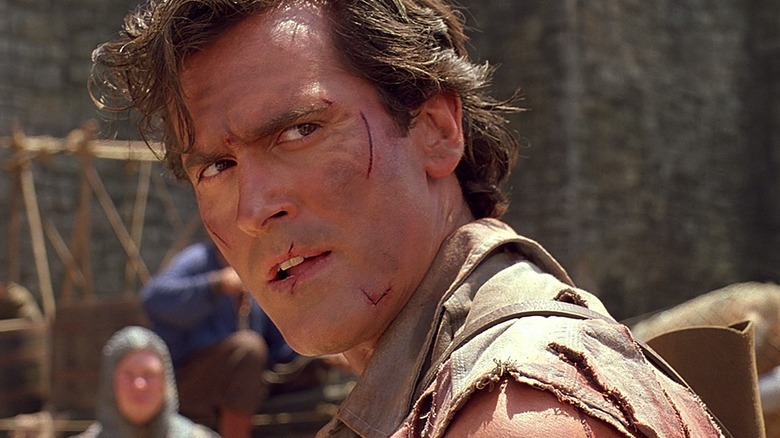 As for who would portray the master of illusions in the quick cameo, Henderson suggested that Bruce Campbell, a longtime Sam Raimi collaborator who had made brief cameos in all of the previous Spider-Man movies, would play Quentin Beck. 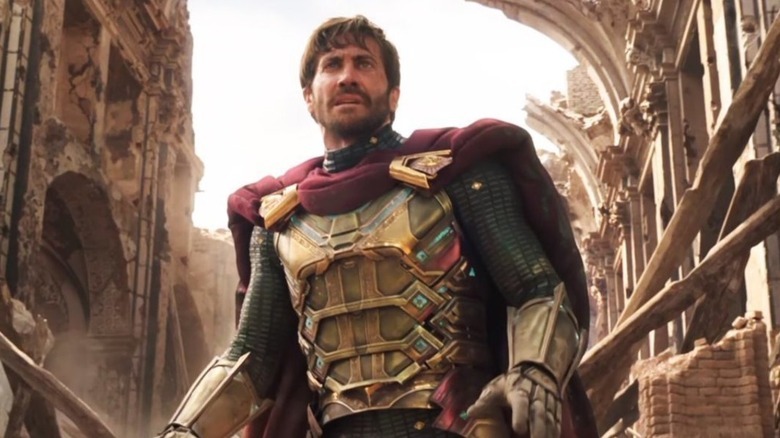 While Jake Gyllenhaal ended up using his considerable dramatic chops to play the villain, it's hard not to be intrigued by what the scenery-chewing Campbell could've done with one of Mysterio's many monologues. It took him a long time to get his big-screen due, but Mysterio finally made the jump to theaters courtesy of Jake Gyllenhaal's portrayal in 2019's Spider-Man: Far from Home. In some ways, his long journey to the big screen is almost a good thing; with the huge advances in CGI and special effects technology made in the last couple of decades, there's arguably no better time for a supervillain to harness the lifelike illusions and movie magic trickery of Mysterio. Plus, given Gyllenhaal's deeply upsetting portrayal of an amoral psychopath in 2014's Nightcrawler, it's almost guaranteed that the villain will be just as creepy and unsettling as his best stories make him out to be. Here's hoping this latest incarnation of this enduring Marvel character ends up sticking around for more than a single outing — and signals a future in which the MCU's villains only get weirder and wilder.